I know, I know… everyone has “their Mom’s” way of making potato salad and nothing could be better than that. But why not try a different version? Something that may not be “better,” but still delicious in its own way? I’ve had versions of potato salad that were so good, it pissed me off because I know that I’d not only never get my hands on that recipe… but I’d probably never be able to eat it again. That’s okay.. because I have something close to 8 different recipes for potato salad that are all awesome in their own right… and they allow me to enjoy both my fruits, veggies, nuts and – gasp! – potatoes. Grab a large pot and boil some water. It’ll need to be enough to cover your potatoes. Take your potatoes and chop them up into chunks no larger than an inch on any side, and toss them into the pot. Let it boil for approximately 25 minutes. 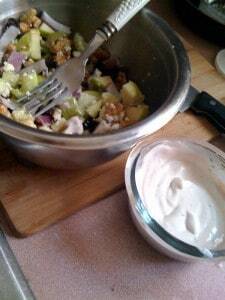 While that’s going, chop your celery, red onion and apple into chunks. Crush your walnuts so that they’re in smaller pieces. 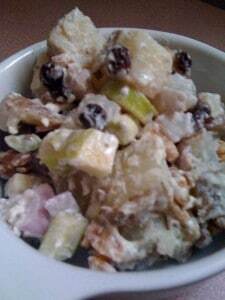 Toss your chopped celery, red onion, apple, walnuts, raisins and blue cheese in a large bowl that should also be able to accommodate your potatoes as well as the rest of your ingredients. When your potatoes are done cooking, they’ll be able to be speared with a fork, but not crumble at the touch. Pour them out of the water and toss them in the vinegar. Let them cool down (you can refridgerate them – I didn’t.) After they cool, pour them on top of the ingredients in the large bowl, and stir lightly to blend everything together. In a side dish, blend your yogurt, red wine vinegar, pepper, salt and rosemary together quickly, and pour it all over the top of your potato salad in spoonfuls, stirring your salad inbetween spoonfuls. You might find that you need less dressing… or more. Totally up to you. I’m going to try this recipe soon. I love the traditional potato salad with the mayonnaise, eggs…but this sounds like it will be delicious as an alternative sometimes.